Make no mistake about it. Even though success has been illusive at best, the US is intent on staying in Afghanistan and Iraq for an open-ended time period. Six years after the first U.S. bombs began falling on Afghanistan's Taliban government and its al-Qaeda guests, America is planning for a long stay. 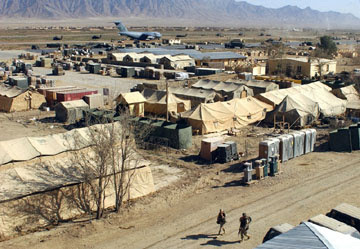 Originally envisioned as a temporary home for invading U.S. forces, the sprawling American base at Bagram, a former Soviet outpost in the shadow of the towering Hindu Kush mountains, is growing in size by nearly a third. Today the U.S. has about 25,000 troops in the country, and other NATO nations contribute another 25,000, more than three times the number of international troops in the country four years ago, when the Taliban appeared defeated. The Islamic militia has come roaring back since then, and 2007 has been the battle's bloodiest year yet.